Toxoplasmosis is an infectious disease caused by the spread of Toxoplasma gondii, a parasitic alveolite with an interesting life cycle. It exists in three forms. First, oocysts are produced in cats and passed in feces or urine. The oocytes can then be transmitted to humans and other intermediate hosts, including house mice. Toxoplasma gondii then develops into tachyzoites, which rapidly multiply before localizing to muscle tissues and the central nervous system; at this point, they develop into cysts called bradyzoites. These can then be transmitted by consumption—for instance, when a domestic cat eats a mouse. Though humans are a dead end for the parasite (because house cats do not typically eat humans), as much as half of the world's population carries it asymptomatically. Dangerous for pregnant women and people with compromised immune systems, the latent form of the disease is also noted for its presumed effects on behavior. There is evidence linking T. gondii to the incidence of schizophrenia, OCD and bipolar disorder, and a possible correlation with the probability of traffic accidents. Because the prevalence of different forms of T. gondii is associated with human activity, it is likely that the spread and differentiation of strains occurred 11,000 to 4,000 years ago as humans established agriculture and agrarian societies. It is also notable that strains in the Northern and Southern Hemispheres differ, with less virulent strains predominating north of the equator. An international group of public health researchers recently developed a model of T. gondii to link landscape ecology and parasite virulence. They've published their results in the Proceedings of the National Academy of Sciences, in which they conclude that virulence to house mice and the capability of overcoming strong infection are likely important factors affecting the genetic diversity of T. gondii. The researchers write, "The extant conditions in tropical South America, where much of the Amazon rainforest region remains relatively unaffected by the agricultural landscapes that predominate in the Northern Hemisphere, likely resemble the primordial state of the parasite, whereas genetic uniformity observed elsewhere represents a relatively recent anthropogenic state." They note that virulent strains likely emerged in order to better infect animals that already had resistance to less virulent strains. Those mice would likely survive this superinfection, though the trade-off for virulent strains of T. gondii is that unexposed animals would die from infection, thus constraining the pool of hosts. "Our model affirms the strong influence that superinfection rates and host population dynamics have on competing parasites," the authors write. These factors create trade-offs between host longevity against strategies that displace prior, less virulent infections. The authors note that the dramatic expansion of human civilization created sudden changes in the global landscape, altering animal populations worldwide. This includes conditions favoring the rise of domestic animals and rodents, thereby affecting populations of parasitic microbes. The coevolution of hosts and parasites could have favored the spread of certain strains. The researchers note that T. Gondii strains from French Guiana are more transmissible through domestic cats than those isolated from jungle ecosystems. Finally, domestic cats can heavily contaminate households and farms with T. gondii oocysts, causing increased infections of farm animals, domestic animals and rodents, and the expansion of subsets of T. gondii genotypes. "Expansion of agriculture would further distribute this subset of parasite strains, consequently reducing regional diversity of the parasite," the researchers write. They conclude by noting that their study is a general overview, and that future studies are needed to better understand the roles of animal hosts in the transmission of the parasite, and the influence of different anthropic settings. A majority of emerging infectious diseases in humans are zoonoses. Understanding factors that influence the emergence and transmission of zoonoses is pivotal for their prevention and control. 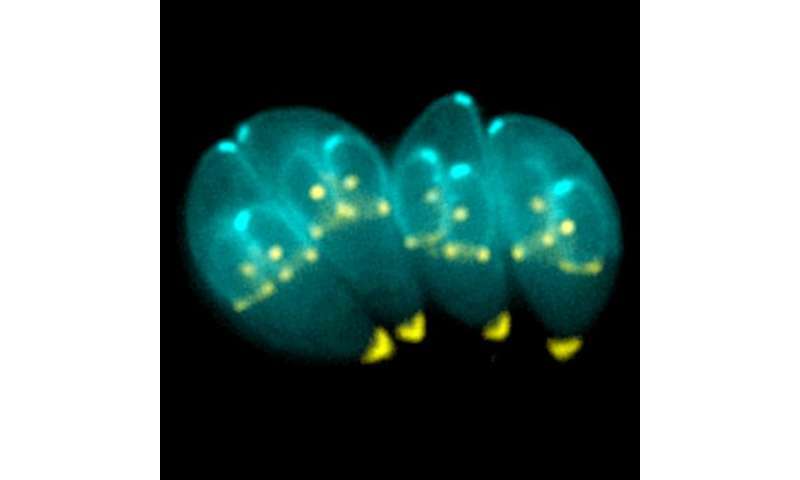 Toxoplasma gondii is one of the most widespread zoonotic pathogens known today. Whereas only a few genotypes of T. gondii dominate in the Northern Hemisphere, many genotypes coexist in South America. Furthermore, T. gondii strains from South America are more likely to be virulent than those from the Northern Hemisphere. However, it is not clear what factor(s) shaped modern-day genetic diversity and virulence of T. gondii. Here, our analysis suggests that the rise and expansion of farming in the past 11,000 years established the domestic cat/mouse transmission cycle for T. gondii, which has undoubtedly played a significant role in the selection of certain linages of T. gondii. Our mathematical simulations showed that within the domestic transmission cycle, intermediately mouse-virulent T. gondii genotypes have an adaptive advantage and eventually become dominant due to a balance between lower host mortality and the ability to superinfect mice previously infected with a less virulent T. gondii strain. Our analysis of the global type II lineage of T. gondii suggests its Old World origin but recent expansion in North America, which is likely the consequence of global human migration and trading. These results have significant implications concerning transmission and evolution of zoonotic pathogens in the rapidly expanding anthropized environment demanded by rapid growth of the human population and intensive international trading at present and in the future.